Around this point in the week, my dinner- menu- planning creativity always seems to start running out of steam. And when the temperature is below- frigid outside like it is on the East Coast (I believe the technical meteorological terminology is "colder than a witch's bosom"), I'm not particularly inspired to make the rounds to my neighborhood grocery purveyors. Pour about half a jar of tomato sauce into a large rimmed frying pan, covering the whole surface of the bottom by 3/4" (or make your own using sauteed garlic, tomato puree and red pepper flakes, if you want to be a fancy pants). Warm on medium heat while stirring occasionally (I recommend wearing an apron or, at least, not your favorite silk evening gown while cooking this, as the sauce has a tendency to pop and splatter in all the wrong places). Crack the whole eggs directly into the sauce, trying to keep them separate from one another, and cover. Let eggs poach until yolks are firm, 3-8 minutes (depending on what "medium" heat means to your stove). One egg per person should be sufficient, but we usually indulge and have two each. Meanwhile butter (or drizzle with olive oil) and sprinkle a little salt on some slices of bread (the same number as eggs you have poaching)- I like something crusty like a boule of French bread, (but whatever floats your boat), place on a cookie sheet, and put under the broiler or in a toaster oven until lightly browned and toasty. Make sure you keep an eye on those suckers- they will burn if you aren't careful. 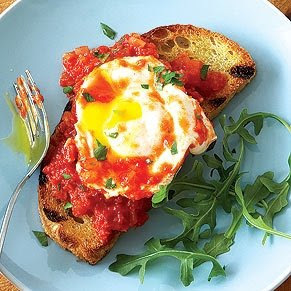 Place bread on a plate, with a cooked egg and some sauce on top, and then sprinkle with Parmesan cheese (and parsley, if you've got it). I usually serve it with a salad for a rustic Italian-feeling meal in under 10 minutes. I can't eggs-tol the virtues of this meal enough- if you want quick and delicious, it's eggs-actly what you're looking for. Can you make this in the dishwasher too?